Requirements are typically discovered and written by a variety of team members and are commonly sourced from a variety of documents and stakeholders at disparate times. All of these factors lead to a tendency for the requirements to lack quality, be inconsistent and to contain issues. Best practice encourages early and continuous reviews of requirements to detect and remove defects before the requirements reach the design and implementation teams. Enterprise Architect provides sophisticated tools for reviewing requirements including the Team Review tool, Element Discussions and Maintenance items. The Team Review is a powerful tool that allows team members to collaborate and review the contents of the repository. It is particularly useful with requirements validation as it allows a set of requirements to be discussed and reviewed. Each review could be set up as a category and then different types of reviews could be setup as topics with posts being used to enter review items. 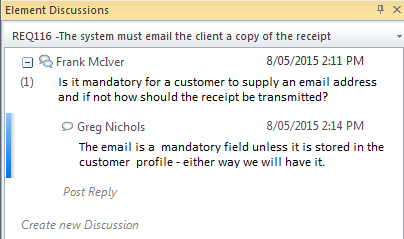 Model elements can be added to a post, allowing - for example - a post to report two or more conflicting requirements. Team members would have the chance to post replies and view the linked elements. 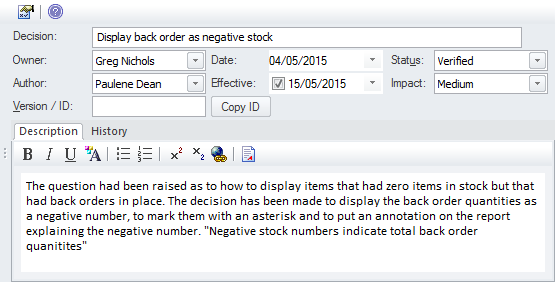 Statuses can be applied to indicate the progress through a workflow. The Team Review tool can be used in conjunctions with the Element Discussion window (where individual elements are managed) and the Discussion window (which contains a composite list of all element discussions in the repository). During the progress of a requirements review there will inevitably be ambiguities, issues and defects detected. Before these are entered against the requirement as maintenance items it is common for analysts conducting the review to want to discuss these items with team members or stakeholders. The Element Discussion window is a useful place to record this information allowing other team members to post replies. This is a particularly powerful facility because in many requirement tools these discussions are typically written in the text of the element making it difficult to produce customer ready documentation until they are all removed. It is quite common for modelers to enter discussions even outside a formal review and these will assist the reviewers to resolve requirement defects or issues. As Requirements are developed Changes will inevitable occur, Issues will be raised, Events will happen, Defects will be found, Tasks will need to be assigned and Decisions will need to be made. 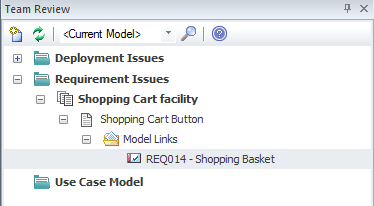 Enterprise Architect has a useful set of facilities to manage these items through the Project Maintenance facility. There is a window for each of these maintenance items where details of the item such as its Name, Description, Author Completion Date and more can be assigned. Enterprise Architect has a convenient Requirements Checklist element available from the Extended Requirements Page of the Requirements Toolbox. This is a convenient way of recording visually whether a Requirement is of high quality and is a useful mechanism for team reviews.